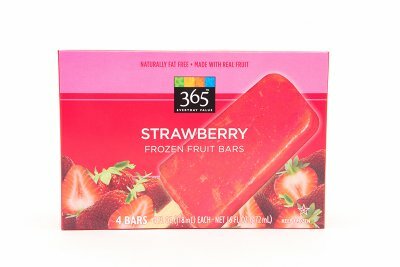 After flaming Snapple for their sorbet bars, I decided to be more positive and share some of the better healthy frozen treats you can find in your freezer section. My favorite has to be the Jolly Llama Sorbet Squeezups. My kids went nuts over these and they are made with whole fruit - not concentrates or juices. There is added sugar but unlike other popsicles that I have reviewed (see: Don't Be Fooled By This Popsicle Marketing Trick), the FIRST ingredient is fruit. They come in blueberry, raspberry, peach, mango, strawberry, acai berry, and banana coconut sorbet flavors. 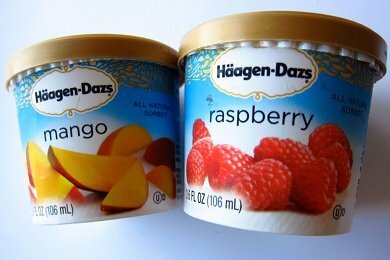 If you can’t find Jolly LLama, you will be able to find the Haagen Dazs sorbet cups in your freezer section. I reviewed them here A Healthy Snack Friend In The Ice Cream Aisle and they cost about $1.25 each. They don’t have as much fruit as Jolly Llama but they are still a good choice. These delicious bars come in an assortment of flavors: Caribbean, Lime, Mango, Strawberry and Coconut. It has 7 grams of sugar per serving and uses agave syrup as the added sugar ingredient. So you are getting about half the sugar and fat as compared to regular ice cream. The beauty of these sandwiches is that they are just trying to be what they are - coconut milk frozen treats! Please share your favorite healthy frozen treats. These products were received for review consideration. No other compensation was provided. Frozen grapes are the best and no points plus for the Weight Watcher types out there. Also tried Dole frozen pineapple cups--it's just pineapple chunks--tasty! 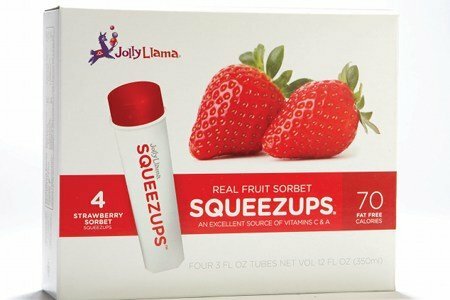 I'll have to try the Jolly Llama squeezes. My fav is Yasso Frozen Greek Yogurt Pops - only 70 calorie and 6 gm protein! 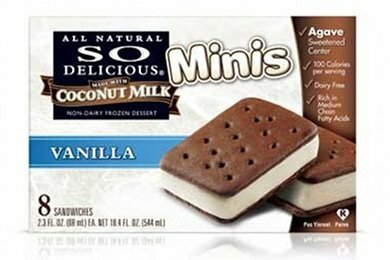 I always think about putting those So Delicious coconut ice cream sandwiches in my cart, but for some reason I've never actually pulled the trigger. Thanks for this information - I was in the habit of eating ice cream every night - WW type but still. I switched to sherbet or yogurt with fruit but I like the idea of sorbet. I like to freeze all natural applesauce cups. They take a long time to eat and are super yummy. Sometimes I sprinkle Cinnamon on them as I eat them. Winn Dixie has a frozen tropical fruit bar as well that is pretty good. I have had the Whole Foods frozen fruit bars and they are pretty good. I have had the strawberry and the coconut...The coconut is kind of weird but it is pretty good. I've been wondering how the mini's taste. Healthy and Agave should not be used in the same post. Agave nectar is just as unhealthy as and processed as high fructose corn syrup is. I know I've had something by Jolly Llama before... I can't wait to try these! Still going with the points program? Luck! Just food for thought for all the organic eaters. You know those vitamins you take? I bet you never looked at where they come from. Happy eating. I love Edy's Fruit Bars. The ones with coconut, pineapple and orange are actually not that bad as long as you aren't watching your carbs and/or blood sugar... a nice treat for once-in-a-while, certainly better than other things.